We spoke to Jesper Tønder, Digital Business Developer at Online Partners. In this post he gives some of his thoughts of data feed marketing and what he would like to see progress in the future of this industry. Could you tell us a bit about yourself and what do you do at Online Partners? I work in our business development department at OnlinePartners. I ensure that our clients exploit all elements of online marketing, thereby ensuring a homogeneous 360° solution. My job is to basically to keep our clients 2 steps ahead of their competition, using the latest techniques and features of online marketing. I was introduced to Google shopping when it launched in Denmark in 2013. Since then a long list of services have been available, which is also why you need something extra in order to stand out in the search results. In short: Product feeds are deceptively easy to use. While they require little work to become effective, it requires substantial work to optimize the feed and get the most performance out of your product feed campaigns. What other applications do you see in the future for Data Feed Marketing over the next 5 years? Smarter feeds, that are more tightly connected with a shop. For example, it should automatically delete or estimate values of discontinued products or products with a long delivery time. Feeds should be able to automatically split test e.g. product descriptions, display URLs etc. Product feeds should be able to “learn” the language spoken in an organization and adapt that language to the feed’s content. Smarter bidding so that you get even more visibility, only cheaper. Feeds for other lines of business like Google is doing now with travel industry e.g. consultant businesses etc. 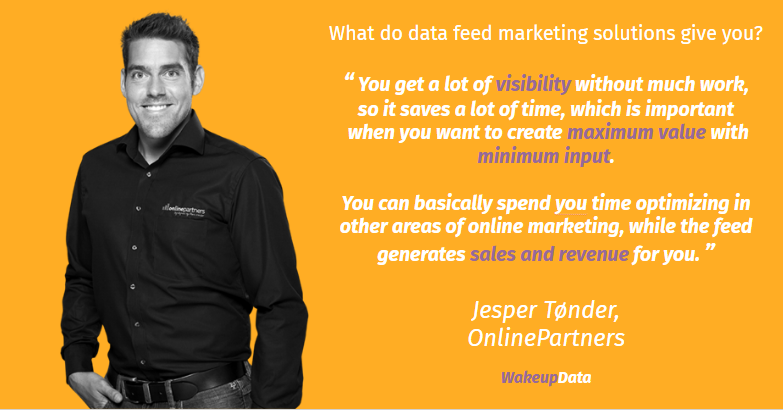 If you have any questions about Jesper's work with Online Partners or if you'd like to hear more about what data feed marketing solutions can do for you, get in touch via the link below.